April 5, 1999: They didn't know they were about to do it, but eight years ago scientists led by a team of astronomers in Huntsville, Ala., were on the verge of discovering the incredible. What appeared to be local firecrackers in the sky, were instead distant megablasts, each releasing more energy in ten seconds than the Sun emits in its entire 10-billion-year lifetime. It was the last thing they expected to find from these accidentally-discovered cosmic enigmas. The stage was set when the Compton Gamma Ray Observatory was launched by the Space Shuttle Atlantis (STS-37) on April 5, 1991. The crew deployed it on April 8 (after helping unstick an antenna). A few days later, the spacecraft started observing the universe with a sensitivity never before achieved. Slowly, as the data began to come in, the science team working on one of the instruments noticed that something was unusual - things did not look as they had expected. At first they rechecked their instrument - the Burst and Transient Source Experiment (BATSE) - to make sure that some glitch wasn't giving an incorrect view of the universe. After just 30 bursts, BATSE was telling the scientists that the sources of mysterious gamma-ray bursts were randomly scattered across the sky and thus probably lay far outside our Galaxy. "John and I started seeing the randomness very early," said Dr. Gerald Fishman, the BATSE principal investigator at NASA's Marshall Space Flight Center. John is Dr. John Horack, a team member whom Fishman credits with ensuring that the instruments were properly integrated into the spacecraft and tested. "Chip [Dr. Charles Meegan] said, 'Calm down, we need to get some more.' We did exercise a fair amount of caution." The BATSE hardware checked out fine. And as the burst count climbed past 100, the scientists realized that they had a major discovery on their hands.
) with the bursts distributed randomly across the sky. Compare it with the sky map of 2,000 bursts near the en o this story. "BATSE changed everything in the fall of 1991 when we announced that gamma-ray bursts were evenly spread across the sky and there was a deficit of weak bursts," Fishman explained. "It's completely changed our views of what gamma-ray bursts are." Gamma rays are photons at energies hundreds of thousands to billions of times higher than the visible light our eyes can detect. Those high energies also make gamma rays impossible to focus and observe using conventional optics such as mirrors or lenses. Instead, astrophysicists build instruments with special materials - such as sodium iodide in BATSE - that interact with the gamma rays to produce visible flashes of light. These flashes are then counted by special light sensors called photomultiplier tubes. Careful arrangement of detectors and shielding turns these instruments into telescopes and spectrometers that map the sky and measure the energy levels of different sources. The Compton Gamma Ray Observatory (CGRO carries four instruments designed to observe the universe in gamma rays. Burst And Transient Source Experiment (BATSE) at NASA/Marshall to continuously monitor a large segment of the sky for detection and measurement of short, intense bursts and other transient sources of gamma rays. BATSE comprises eight large-area detectors (20 keV - 1.9 MeV) and eight spectroscopy detectors (10 keV - 100 MeV) arranged on the faces of an imaginary octahedron. Each detector will face a burst at a slightly different angle, meaning the brightness will be different on each face. 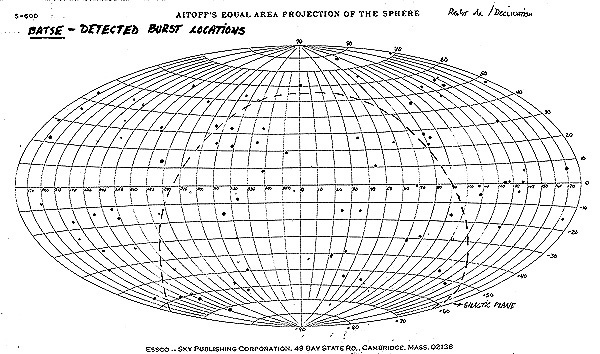 This allows scientists to calculate the direction to the burst source. Oriented Scintillation Spectrometer Experiment (OSSE), Naval Research Laboratory in Washington, D.C. Detects nuclear-line radiation and emissions associated with low-energy gamma-ray sources anywhere in the sky. This information is contributing to the understanding of many types of science targets such as novae, supernovae, neutron stars, black holes, pulsars, quasars, and X-ray sources. Imaging Compton Telescope (COMPTEL), a joint venture of Germany, the Netherlands, the European Space Agency, and the United States. Measures gamma rays in the 0.8-30 MeV range. Imaging capability, broad effective aperture, and low-background needed to study point sources, diffuse emission from the galaxy, cosmic diffuse flux, and broadened line emissions. Energetic Gamma Ray Experiment Telescope (EGRET), NASA's Goddard Space Flight Center, Stanford University, Grumman Aerospace, and Germany. Measures gamma rays in the 30 MeV to 30 GeV range. It can measure the direction of a point source to a fraction of a degree and determine the spectrum of gamma-ray emissions. Emissions from other galaxies are examined to study their structure and dynamics and the distribution of cosmic rays within them. In addition to CGRO, a number of Earth-orbit and interplanetary spacecraft carry gamma-ray burst detectors to provide a much larger baseline so astrophysicists can locate burst sources with greater precision. Fishman, Meegan, a co-investigator at NASA/Marshall, and other scientists expected that BATSE would show most of the bursts were clustered along the Milky Way, the bright band across the heavens where most of our galaxy's stars are located. "This was inconsistent with any known distribution of objects in our galaxy," Fishman said. "That immediately caused a significant fraction of the scientific community to rethink the galactic neutron star model of bursts, and start thinking about cosmological models." Fishman described presenting his finding in October 1991 to a GRO science meeting: it was total silence "followed by a series of rapid-fire questions. It was an electrifying experience. Once in a lifetime." But the change wasn't universal. "We took a lot of heat from people trying to blame flaws in BASTE," Meegan said. "We were like the first wave hitting the beach, and everyone took shots at us." But the rigorous control held over BATSE during assembly and testing gave scientists the assurance that they were indeed getting a new view of the universe. Fishman admits getting a slight knot in his stomach, and not just because he was about to upset a cherished theory. "All that summer I got a queasy feeling because I realized the significance of what we were finding," he continued. "It actually scared me somewhat because I realized these are the largest known explosions in the universe." The implication was that they were incredibly distant and therefore incredibly bright. Since then, scientists have continued to debate possible sources, and BATSE continued recording about 8 new bursts every 10 days. In late 1997, it reached No. 2,000. Last week, the count was near 2,400. Almost four times as many bursts have actually happened in that time, since the Earth blocks almost half the sky from BATSE, and other factors cut in half the number of bursts that BATSE can detect. It was one of those "over-the-horizon" bursts that helped nail down the distance to bursts. On Jan. 23, 1997, Italy's Beppo SAX X-ray astronomy satellite was pointed in the right place at the right time. Ironically, CGRO was just 5 minutes below the horizon and missed the show. But a scientist affiliated with the BATSE team was able to use time on an optical telescope to use Beppo SAX data and pin the burst to a distant galaxy that then was studied by the Hubble Space Telescope. 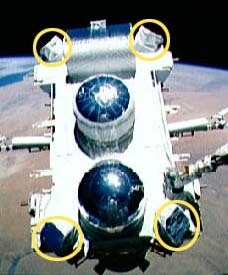 Chance is less of a factor now with the addition in 1997 of the University of Michigan's Robotic Optical Transient Source Experiment (ROTSE) that takes a cue from BATSE and quickly points an array of four cameras in the right area. On. Jan. 23, 1999, it captured the first optical images of a burst "in the act" just 20 seconds after BATSE was triggered, and while the burst was still emitting gamma-rays. Yet even with this wealth of data, scientists still aren't sure what causes the bursts. Initially, they thought that the bursts were caused by two neutron stars orbiting each other and eventually colliding, or a neutron star being swallowed by a black hole. Little else could account for a blast that emits more energy in a few seconds that our sun will emit in its entire lifetime. None of the theories solved all of the problems, including going directly to gamma-ray emissions. Now scientists are studying the hypernova model. This involves a star about 50 times as massive as our sun reaching the end of life. It has burned everything its core, implodes and then explodes. It seems to be the only way of producing a fireball whose shock front moves near the speed of light and generates the immense quantities of energy required. It would also appear to be something common in the early universe, but far less likely in older, closer galaxies. Gamma-ray bursts could be closely linked to our own lives since the dust that became planets was forged in the hearths of explosions like supernovas and hypernovas. BATSE has also been applied to studying less powerful - yet incredibly interesting - events as well. Its name also says "transient," meaning objects that come and go. "BATSE has done a lot more than bursts," Meegan said. "It has observed pulsars and other objects by Earth occultation. We weren't sure that was going to work." This approach makes the Earth a part of the instrument as the satellite's orbit makes sources rise and set. The trick was in the math that could sift through a sky simmering and occasionally bursting in gamma rays so that any chosen point source could be studied. "In theory it was possible, but we weren't sure if it was practical," Meegan said. "and lo and behold, some folks here - notably Dr. Nan Zhang (a National Research Council fellow) - were able to do it with large section of the sky using a derivative of a medical imaging program." The technique is a little like sitting inside a room with frosted glass walls and studying a flashing light just based on rapid changes in brightness and comparing the brightness of the different windows. "That amazes people," Fishman said, "how we can home in on independent sources across the sky. We've been extremely successful in observing more than 50 individual objects." Many exciting and controversial new results are expected at the Fifth Huntsville Gamma-Ray Burst Symposium to be held 18-22 Oct., 1999 at the Hilton Hotel in downtown Huntsville, Ala. The last two years have been an exciting time for the gamma-ray burst community. Following the detection of X-ray, optical and radio afterglows, the long discussion between proponents of galactic and cosmological distance scales has been settled in favor of the latter. Redshifts up to z = 5 have now been suggested for a handful of burst sources, which are suspected to be connected with young galaxies. These results have led to much observational and theoretical activity, and have widened the scope of discussions on gamma-ray bursts to include areas as diverse as the history of the star formation rate and accretion disks around recently formed black holes. The scientific program will cover the expanding range of gamma-ray burst research. Roughly half of the sessions will be devoted to prompt burst emission, and half to afterglows, both from observational and theoretical perspectives. There will also be sessions on soft gamma repeaters (magnetars) and future instrumentation. BATSE has discovered five new bursting pulsars - including a unique pulsar that bursts twice each orbit instead of once - and made the most complete observations of Cygnus X-1, the most studied black hole system in our galaxy. It also found gamma ray flashes coming from lightning in Earth's atmosphere. Atop that is another impressive statistic: 18 doctorates earned by graduate students working with BATSE data. "This is something I'm really proud of," Fishman said. "These are some of the brightest students I've ever seen." They have come from the California Institute of Technology, Harvard University, Rice University, the University of Alabama in Huntsville, Stanford University, Moscow State University in Russia, the University of California in San Diego, the Massachusetts Instiute of Technology, and others. In addition, of the top 20 authors cited most often for 1996 in Astrophysical Journal Letters, four are from the BATSE team: Fishman, Meegan, Dr. Alan Harmon of NASA and Dr. Chryssa Kouveliotou of the Universities Space Research Association. "Even though the emphasis is on locating and studying optical and X-ray counterparts," Fishman said, "BATSE is still the most sensitive instrument for measuring gamma-ray bursts for the next five years. Even after the launch of the SWIFT satellite, it still will be the most sensitive at the higher energy levels." Depending on solar activity which can expand the outer atmosphere and accelerate a satellite's return to Earth, BATSE and the other GRO instruments should operate until 2006 and perhaps as long as 2009. That's time enough for another 2,100 to 3,000 bursts. Who knows what surprises are in store? "The universe turned out to be a lot more interesting in terms of what we were trying to do," Meegan said of the burst discovery. It may do it yet again. Gotcha! The big one that didn't get away. - Jan. 27, 1999. Describes the first optical photograph of a gamma-ray burst while the event was in progress. Gamma-ray Bursters cross the 'Line of Death' - Oct. 13, 1998. A study of gamma ray burst spectra shows one more thing that these mysterious, cosmological gamma ray bursts are not. Blast from the past: the latest clue in solving the gamma-ray burst mystery (May 6, 1998). Discovery may be "smoking gun" in gamma-ray mystery (March 31, 1997).